Blogger RAK's and a Happy 4th of July! 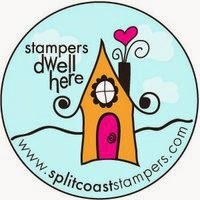 I am finally posting a few Blogger RAK cards I have received from some wonderful stamping friends! I love each and every one of them! I hope you all had a wonderful 4th of July filled with food, friends, family and of course firework displays! Look what Jen Hensley sent to me! 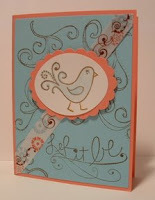 I love this little birdie by Rhonna Farrer, it's so cute! I have this stamp, but haven't gotten a chance to use it yet. Thanks so much Jen - I love it! This cutie patootie was sent to me by Tammy Fite. This is one of my favorite sets from the new catalog! I love this card Tammy, thank you so much for sending it to me! This adorable Blogger RAK came from Diane Gilbert. I absolutely love this Diane!! 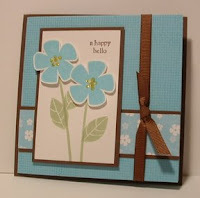 I love everything about it, the colors, the stampset, everything! Thank you so much for thinking of me! You got some great RAKs, Kendra! Super RAKs! I love them all! 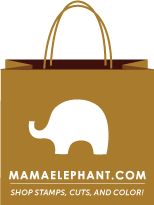 You've got some very talented blogger friends!